President Emmerson Mnangagwa says he will soon revise again under-fire Finance minister Mthuli Ncube's controversial two cents per dollar transaction tax - which caused widespread panic in the country when it was introduced last month. This comes after the Daily News accurately reported at the time that when Ncube announced his tax that he did not have Mnangagwa's approval then. As it is, Ncube has already been forced to eat humble pie after he was forced to tweak the unpopular tax soon after he announced it - following a huge public backlash which saw panicking shoppers hoarding goods and prices of basic goods rising sharply. Writing in his weekly column in State media yesterday, Mnangagwa said his government would soon review the two cents per dollar tax. "Government took to heart the cry that the two percent transactional tax has compounded the tax burden for both business and for the consumer. "Once the legal instrument we are crafting against unexplained wealth and deposits is in place, new measures will be announced to review the tax which, among other considerations, had been occasioned by illicit activities in the financial services sector," he said. Recently, a civil society group petitioned the High Court seeking to have the tax declared illegal. However, the matter was ruled not urgent and will thus go on the normal court roll. Ncube introduced the two cents per dollar tax as part of a raft of economic measures aimed at reviving the country's sickly economy. "At the occasion of the presentation of the 2018 Mid-Term Monetary Policy, I announced a review of the Intermediated Money Transfer Tax from the current 5 cents per transaction to 2 cents per every dollar transacted. "Further details pertaining to the tax are as follows: The 2 cents per dollar tax will apply on transactions of $10 and above only. Transactions below $10 will be exempt from this tax. "There is a cap of $10 000 on the amount of tax to be paid. This implies that transfers above $500 000 will attract a flat tax of $10 000," he said as he released his revised measures. Ncube also said internal company transfers, as well as transfers of salaries, tax payments, foreign currency-related payments and transfers of funds by the government would also be exempted from the new tax. Yesterday, University of Zimbabwe political science lecturer Eldred Masunungure said developments of the past few weeks suggested that Ncube needed to "shape up" - otherwise, he would risk being forced to resign by the old guard in Zanu-PF "which he has no doubt angered". "Mthuli is a technical expert. He has the skills to do the job, but ... given the vicious minefield he finds himself in, he is going to have a difficult time navigating the Zanu-PF politics. "He is a novice in our brand of politics and he needs to sharpen his politics. But I don't think he will manage that. "He either has to learn politics quickly or prepare to resign. I am not surprised that the two percent tax will now be revised," Masunungure told the Daily News. 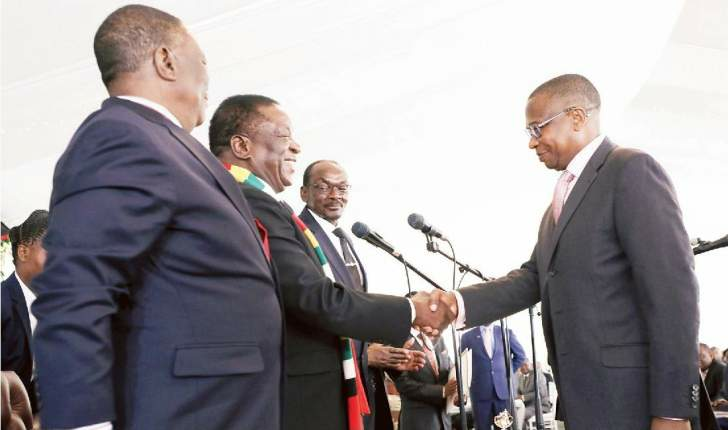 Following his announcement of the tax, Ncube was forced to hold an emergency meeting with a concerned Vice President Constantino Chiwenga and Reserve Bank of Zimbabwe (RBZ) governor John Mangudya - leading to the release of the revised tax measures. This came after Mnangagwa had apparently directed his deputy to look into the issue, which had created panic among long-suffering Zimbabweans - who swamped supermarkets buying anything they could lay their hands on, amid a rampaging parallel market where foreign currency rates had hit the roof. Ncube's relationship with Zanu-PF hawks is said to be strained after they attacked him for rushing to announce the tax without consulting the former liberation movement's hierarchy.